In Coming Home Director Zhang Yimou has succeeded where so many others fail. He has directed superb actors in a love story that washes slowly over the audience while handing them an indelible memory. Everything is secondary to the story of love between teacher Feng Wanyu (Gong Li) and her husband, college professor Lu Yanshi (Chen Daoming). The couple is caught in the awful confusion of life in the 1970s after China’s Cultural Revolution. In the opening scenes, we learn that Lu has been imprisoned and sent away for years of “re-education.” During that long, desolate time in the threadbare surroundings of their house and village, his wife, Feng is raising their daughter, Dandan (Zhang Huiwen), an aspiring dancer who is wrapped in youthful self-absorption. She is also vulnerable to the dictates of the Communist culture that has so damaged her parents. We learn too that after escaping his captors, Lu made his way to his home village and found his daughter before finding his wife. Locked in the conformity of the culture that surrounded her and scared of losing her dancing career, Dandan turns her father in to the police. Savagely beaten, Lu is taken away again. All this happens very quickly in the opening scenes and becomes the basis for the assumptions that carry the rest of the film. Feng and Lu have spent two decades apart in the worst of circumstances – he in prison and she scraping by in a dilapidated building, but for each, the thought of the other, is always there. Feng looks everywhere for Lu, waiting for him to walk in the door. As the film unwinds, director Yimou gives us a cold and terrible glimpse of life in Communist China along with the differing generational differences in attitude. Young people, after all, have known nothing else. When Lu is freed after his long imprisonment, he returns to find Feng lost in the world of Alzeimer’s symptoms. On the fifth of every month – the day he had said he would be returning – Feng dresses nicely and goes to the station to meet him, failing every time to recognize the man standing beside her. Much of the emotional impact of the movie comes from the universal heartbreak of not being recognized by the person you love. This awful sadness reduces its audiences to absolute silence. 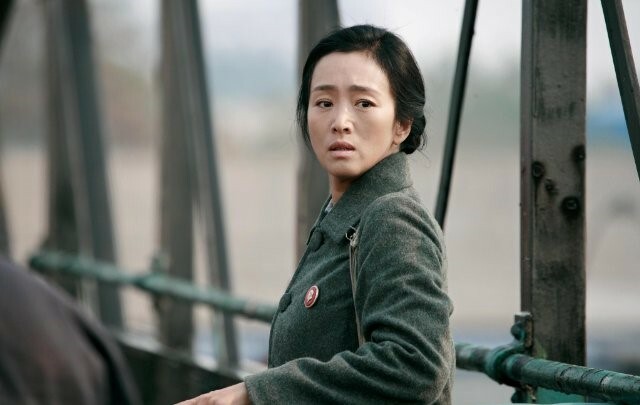 It is the collective stillness of people absorbed and deeply moved, and it happens here because of the remarkable acting of Gong Li with generous support from Chen Daoming and Zhang Huiwen as Lu and Dandan. Gong Li, China’s premier actress, is the partner of Director Yimou and together they have made a wide variety of movies that are applauded and appreciated around the world. In this one they have created a couple whose love for each other overrides the utter despair of each of their lives for two decades. They have given us a love story that silences us all. This review was posted on October 3, 2015, in Drama, Romance, War. Bookmark the permalink.